Why does the SilkCentral Test Manager (SCTM) Web Service method getNode() return a Java Exception if the node id is for a SilkTest Workbench Test Plan? When using the SilkCentral Test Manager (SCTM) API Web Service to interact with the Test Plan if you try to specify a "Test ID" of a Test Plan which is of type “SilkTest Workbench Test” or “TestPartner Test” to the getNode() method it will result in a Java Exception. Results in the following exception being written to the SCTM Frond End Server log file. 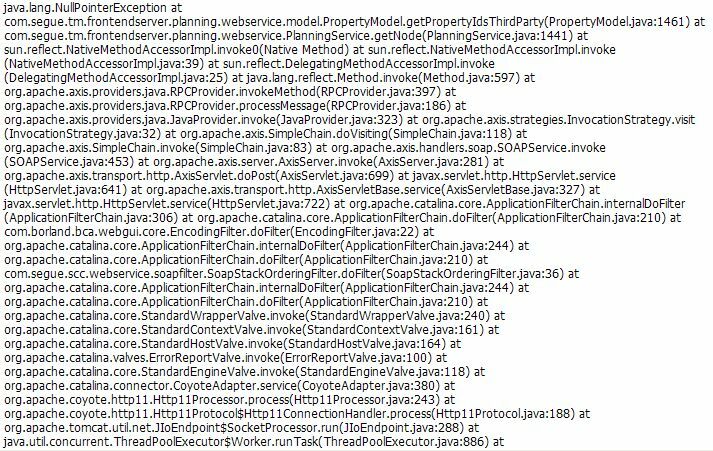 The reason why this type of error occurs is because in SCTM 2011 tests of type “SilkTest Workbench Test” or “TestPartner Test” were not yet enabled in the Web Services resulting in this exception. This issue will be fixed in the next version of SCTM (version 2012) however in the interim you can resolve the error by contacting Microfocus support and requesting a copy of Hotfix 13.